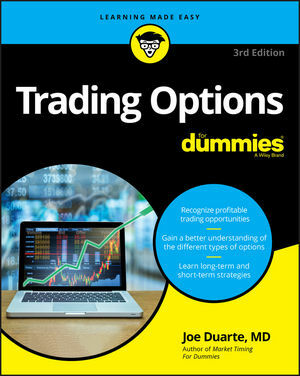 Updated with new facts, charts, and strategies to help investors beat today’s tough markets, Trading Options For Dummies helps you choose the right options based on your investing needs. It will show you how to weigh the costs and benefits, build a strategy to gain no matter the market conditions, and broaden your retirement portfolio with index, equity, and ETF options. Because options cost less than stocks, they’re a versatile trading instrument. If you’re an investor with some general knowledge of trading but want a better understanding of risk factors, new techniques, and an overall improved profit outcome, Trading Options For Dummies is the book for you. Trading options can be a great way to manage your risk, and this detailed reference gives you the expert help you need to succeed. Joe Duarte, MD is a financial writer, private investor and trader, and former money manager/president of River Willow Capital Management. His work has been quoted in Barron's, Marketwatch.com, and The Wall Street Journal. He is the author of Trading Futures For Dummies and Market Timing For Dummies.